Sustainable soil management implies the efficient utilization of natural resources including water, energy, land, and nutrients. The resource efficient optimization of such soil services requires a systemic understanding of the biological, chemical and physical processes interacting in the soil system as well as its dynamics with soil management. focuses on the sustainable use of soils for the bioeconomy. To this end, BonaRes conducts research to improve the evidence base for sustainable soil management. The ultimate goal of BonaRes is to extend the scientific understanding of soil ecosystems and to improve the productivity of soils and other soil functions while developing new strategies for a sustainable use and management of soils. how can the use of water and nutrition be made more efficient? how can land use strategies and land use management be optimized? modelling concepts and assessment tools for a sustainable soil management. The future vision is that decisions on soil management options can be based on improved and operational scientific evidence that will lead to an improved maintenance of the fertility of soils and their diverse functions and services for a sustainable utilization in the context of the bioeconomy. 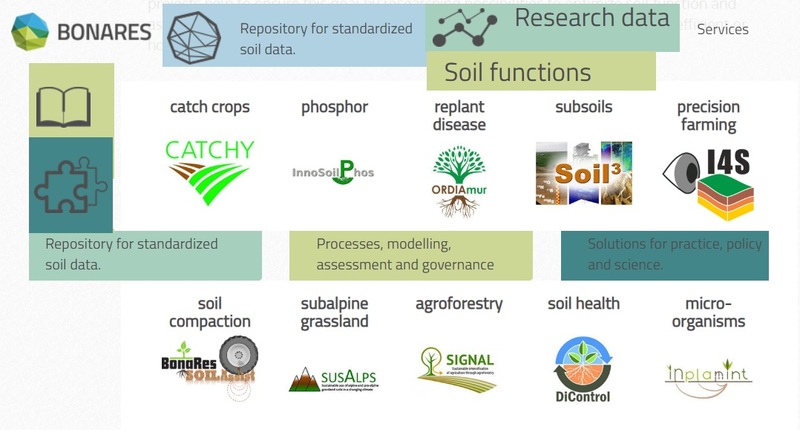 ... provides information about the BonaRes projects, access to data, knowledge and models, as well as to decision support options for a sustainable soil management. Detailed information on research data can be received from metadata which is freely available in principle. Further options on visualization or on data download depend on regulations within the data guideline. Check BonaRes metadata editor. The Data Portal offers the possibility to search for local, temporal (check here) and addressed criteria within the data base of the BonaRes Data Centre. Discover VEST/AgroPortal AgriSemantics map of Data Standards, FAIRSharing, RDA IGAD ‘Landscaping the Use of Semantics to Enhance the Interoperability of Agricultural Data' … and keep coping with FAIRifying challenge!